National Institute of Fashion Technology is conducting NIFT 2019 in pen and paper based mode. Around 23, 000 aspirants have registered for the exam. The exam will be held across 32 cities in India. NIFT 2019 is being conducted in two shifts. The first shift is held for Creative Ability Test (CAT) from 10:00 am to 01:00 pm. The second shift will be conducted for General Ability Test (GAT) from 02:30 pm to 04:30 pm. Students appearing for NIFT 2019 had to report to their respective exam centres at least one and a half hours prior to the commencement of the exam. Careers360 brings to you NIFT 2019 live updates for both the shift and keep you updated on each and every event happening at the exam centres. 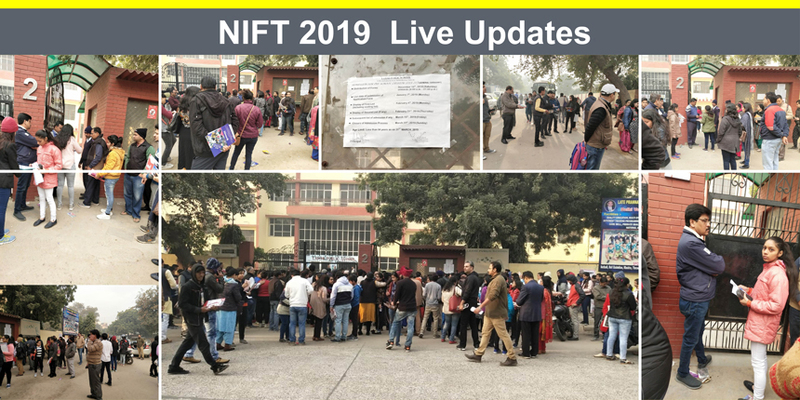 Watch Careers360's Video on "NIFT 2019 Exam Day Highlights"
1: 03 P.M: Parents are waiting outside the exam centre. 8: 45 AM: Entry to the examination centre has started. 8.30 AM: Students have been asked to leave their baggage mobile phones outside their examination hall before entering. 8:00 AM: Students have started reporting at the exam centre.